In “Alliance Coercion and Nuclear Restraint,” Gene Gerzhoy offers a novel theory of how alliances can prevent nuclear proliferation. 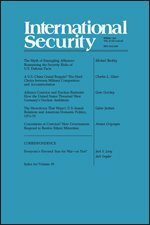 Contrary to the conventional wisdom, which holds that alliances prevent proliferation by reassuring the client state and providing a substitute for an indigenous arsenal, Gerzhoy argues that clients in threatening security environments will nonetheless be interested in nuclear weapons since they can never have full confidence in their patrons’ present and future commitments. As a result, in order to prevent a client from going nuclear, the patron must employ threats of military abandonment, coupled with an assurance that its security commitment will be maintained (or increased) if the client complies and gives up its nuclear program. Whether these threats are successful, according to Gerzhoy, depends on the degree to which the client is militarily dependent on its patron. The article tests the theory with an in-depth examination of U.S. policy toward West Germany’s nuclear ambitions in the 1950s and 1960s. Consistent with the theory, Gerzhoy finds that West Germany was interested in nuclear weapons despite American protection, and that it only gave up these ambitions as a result of American coercion and assurances. Gerzhoy’s article is without a doubt a major contribution to the literature on nuclear proliferation. In addition to providing a novel, coherent theory of how alliances can prevent proliferation through coercion rather than just reassurance, the article also helps resolve the puzzle of why so many states with nuclear protectors have nonetheless sought their own nuclear arsenals. As Gerzhoy explains, “military insecurity and uncertainty about a patron’s intentions create powerful incentives for states to seek both security guarantees and nuclear weapons,” the latter as a hedge against allied abandonment (96). The fact that insecure clients will worry about their patrons’ commitment helps explain why, as Gerzhoy notes, twelve out of twenty-seven U.S. clients explored or pursued nuclear weapons during the Cold War in spite of American protection (99). This even includes clients that were home to large contingents of U.S. troops and U.S. nuclear weapons, including South Korea, Taiwan, France, the United Kingdom, and West Germany. If reassurance should have operated in any cases, it should have been these. In addition to the theoretical contribution, Gerzhoy’s article makes a significant empirical contribution as well, providing intriguing evidence on a historically pivotal but understudied case of (non)proliferation. As Gerzhoy rightly notes, many proliferation datasets and scholars overlook the West Germany case entirely (93). Building on the work of two historians, Marc Trachtenberg and Hans-Peter Schwarz, Gerzhoy deftly combines secondary and primary sources. The article convincingly demonstrates that Bonn was indeed interested in acquiring nuclear weapons but that a combination of U.S. coercion and assurances forced German leaders to back away from these plans. Beyond simply drawing attention to the West German case, Gerzhoy’s work improves on existing scholarship in a number of ways. By highlighting the crucial importance of alliance coercion, the article moves beyond important work by Philipp Bleek, Eric Lorber, and TV Paul on alliances and proliferation that focuses solely on reassurances. It also improves on the few works of political science scholarship that engage with the West Germany case, most recently that of Nuno Monteiro and Alexandre Debs. Although their historical account largely mirrors that of Gerzhoy, and concurs on the role of U.S. coercion, their theory cannot explain why West Germany was interested in nuclear weapons in the first place. After all, their theory holds that, “When the powerful ally shares all of the protégé’s serious security threats and possesses the capability to mitigate them, the protégé is unlikely to see a benefit in nuclear acquisition and will no longer possess the willingness to nuclearize.” The United States clearly shared West Germany’s only serious security threat (the Soviet Union). Moreover, Washington offered Bonn perhaps the strongest allied commitment in U.S. history, providing not only hundreds of thousands of American troops and a formal treaty guarantee, but also stationing nuclear weapons in West Germany and providing West German troops with physical access to those weapons under the NATO stockpile plan. Monteiro and Debs therefore cannot explain why Bonn was interested in nuclear weapons at all. Gerzhoy resolves this problem by explaining that clients in insecure environments will always worry that a commitment will not endure, no matter how strong it appears to be at the time. Despite its many strengths, Gerzhoy’s work raises a few questions. First, the theory and case evidence are somewhat unclear about what is needed to successfully assure clients in concert with the coercion. The article initially suggests that deploying troops and consulting on military strategy are the silver bullets (92), but this raises the question of how many troops are necessary and exactly what type of consultation is needed. Moreover, in the West Germany case itself, the Johnson administration’s decision to abandon the Multilateral Force seems to have played a critical role in undermining U.S. assurances, thereby leading Bonn again to flirt with nuclear weapons (118-119). This suggests that promising multilateral control of nuclear weapons—in addition to troop commitments and consultation—was a crucial aspect of U.S. assurance in this case. From a policy perspective, it would be useful to have a more specific answer as to what exactly to offer an ally in order to assure it and thereby prevent proliferation. Second, the article begs the question of why clients cannot anticipate that their patrons will coerce them, thus deterring them from starting a nuclear weapons program in the first place. Do they gamble on keeping their programs secret? Do they intend to use the nuclear program as a bargaining chip to extract additional resources or commitments from their ally? My own research on U.S. nonproliferation policy suggests a potential answer for the West Germany case: namely, that the United States did not develop a credible reputation for enforcing nonproliferation until the 1970s, and so West Germany may not, at least initially, have expected such harsh U.S. pressure. Like any good piece of research, Gerzhoy’s work leaves a few questions unanswered that will likely spur future research. But these are relatively minor quibbles. The importance of the theoretical and empirical contribution should make this article required reading for students and scholars of nuclear proliferation. Nicholas L. Miller is Assistant Professor of Political Science and International Studies at Brown University. His research focuses primarily on the causes and consequences of nuclear proliferation. He is currently working on a book manuscript that examines the historical development and efficacy of U.S. nonproliferation policy. His work has been published in the American Political Science Review, International Organization, International Security, the Journal of Conflict Resolution, and Security Studies. He received his Ph.D. in Political Science from MIT in 2014. Marc Trachtenberg, A Constructed Peace: The Making of the European Settlement, 1945-1963 (Princeton: Princeton University Press, 1999); and Hans-Peter Schwarz, Konrad Adenauer: A German Politician and Statesman in a Period of War, Revolution, and Reconstruction (Providence: Berghahn, 1997). Philipp Bleek and Eric Lorber, “Security Guarantees and Allied Nuclear Proliferation,” Journal of Conflict Resolution 58, No. 3 (2014): 429-454; and TV Paul, Power Versus Prudence: Why Nations Forgo Nuclear Weapons (Montreal: McGill-Queen’s University Press), 2000. Nuno Monteiro and Alexandre Debs, “The Strategic Logic of Nuclear Proliferation,” International Security 39, No. 2 (2014): 7-51. Nicholas L. Miller, “The Secret Success of Nonproliferation Sanctions,” International Organization 68, No. 4 (2014): 913-944.